On Monday the Department of Justice [DOJ] filed a brief with the U.S. Court of Appeals for the 5th Circuit in New Orleans. The case in question is the decision out of Ft. Worth (December 2018) holding the Affordable Care Act [“ACA” or “Obamacare”] invalid in its entirety. But does that pronouncement follow logically- will the GOP have an opportunity to put their “Replacement” for Obamacare in place, and become “the Party of Healthcare”? Is the Justice Department announcement a fundamental shift in policy? Can the case out of Texas result in the end to the ACA? That is a lot of questions- but the answers (Unlikely, No, and Yes) are fairly easy to explain. 1. Can the case out of Texas result in the end to the ACA? It all started with the Tax Bill in December 2017, which revoked the penalties attached to the Individual Mandate. In February 2018 GOP State Attorneys General from 20 “Red” states filed a lawsuit in Federal Court in Ft. Worth, Texas, claiming that without the tax penalty the Individual Mandate is moot. 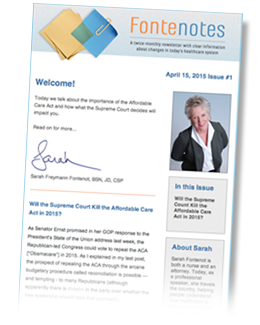 Relying on the Supreme Court’s 2012 interpretation of the ACA in the NFIB v. Sebelius decision, the suit argues that the destruction of the Individual Mandate renders the rest of the law legally invalid. When a Federal Law is challenged the defense usually comes from the government- but in June 2018 the Justice Department announced it would not defend the ACA. In other words, the Federal Government decided not to defend a Federal law. In the absence of a Government defense, Attorneys General from 16 “Blue” states and the District of Columbia intervened to protect the law. A coalition of Associations representing physicians (including AMA, AAFP, and AAP), and another coalition of national Groups representing patients (including the American Cancer Society, The National Multiple Sclerosis Society, the American Diabetes Association and the American Heart Association) filed briefs attempting to convince the Court to save the ACA. The defender’s arguments did not sway the outcome. The Judge, a well-known “staunch conservative” was hand-picked to hear the challenge to Obamacare. On December 14, 2018, he ruled precisely as expected: The entire Affordable Care Act is legally invalid because there are no penalties tied to the Individual Mandate. Why is Obamacare still in effect you might ask? The Appeal put the lower court’s opinion on hold (there is a longer explanation but not for now). Nothing has happened to invalidate Obamacare- yet. What if the Appellate Court agrees with the Texas Court? Would Obamacare go away then? No- that decision would undoubtedly be appealed to the United States Supreme Court. To answer the question: “Could this case result in the end of the Affordable Care Act” the answer is “Yes”- but with a lot of caveats- and certainly not in the immediate future. 2. Is the Justice Department announcement a fundamental shift in policy? Earlier when I said the Justice Department announced it would not defend the ACA in June- that was not the whole story. At that time the DOJ did not come to the rescue of Obamacare, but it could not agree with the entire argument brought by the 20 Red states. The claim- that the loss of Individual Mandate penalties renders the whole law (all 2,000+ pages of it) invalid is a claim that then-Attorney General Jeff Sessions could not embrace. In fact, it is an argument that has come under a lot of legal criticism, including concerns from conservative legal scholars and pundits. But does this development change the outcome of this case? Not really. Obamacare is still the law of the land pending appeal, and the outcome will still be determined by the 5th Circuit Court. The Justice Department didn’t pull the rug out from under the ACA on Monday- it did that last June. This week it just announced a complete divorce. So- to answer the question: “Is the Justice Department announcement a fundamental shift in policy?” I would argue “No”- it is a matter of degree- not a reversal. 3. Will the GOP have an opportunity to put their “Replacement” for the ACA in place, and become “the Party of Healthcare”? To answer this last question let’s give every benefit of the doubt to those who want the President’s prediction to be true. Let’s say the Appellate Court affirms the Texas ruling and ultimately the US Supreme Court adopts the argument of the Red states and rules accordingly. The Affordable Care Act is dead. Now pause and think through the next step. The country would be left without Obamacare but also without a replacement. I can’t say life would return to pre-ACA status quo- because so much has changed in healthcare since 2010- so we would have… what? To give President Trump every advantage let’s say in the vacuum left by the Supreme Court the GOP rises to the challenge (assuming they are in power in both Houses of Congress and hold the Presidency) to propose and pass the conservative counterpart to Obamacare. But here is the Rub. There isn’t one. There are, indeed, some bills that have been written by Republicans- but to consider the possibility of any version getting through a GOP led Congress- take a look back to February through July 2017. In May 2017 the House did pass the American Health Care Act (on a 217 to 213 vote with no Democrats in support), but it only Repealed- not Replaced- Obamacare. The Senate version died in the wee hours of July 28th with Sen. John McCain’s thumb. Throughout this piece I have been referring to 20 “Red” States and 17 “Blue” & D.C.- but that is actually no longer accurate. The Mid-Term elections of 2018 switched political control in two of the states involved in originally bringing the suit in Ft. Worth- consequently Maine and Wisconsin are in the process of bowing out. In the meantime, 4 states (Colorado, Iowa, Michigan and Nevada) recently obtained permission to join the “defender” states.